For relief of indigestion & heartburn. Available in 24, 48 and 100 tablet packs. For relief of more frequent indigestion & heartburn. Available in 24 and 48 tablet packs. Throughout the site we’ve tried to provide details about heartburn and gas, treatment options and details about our products. Sometimes, however, our consumers ask other questions, and you may find these answers helpful. If you don’t find the answer to your question below, feel free to contact us (link is external) and we’ll try to assist you. What are common signs of heartburn? Common signs of heartburn may include a burning pain that begins in the chest or at the breastbone and moves up toward the throat, a feeling that food is coming back into the mouth, an acidic or bitter taste at the back of the throat, an increase in severity of pain when you’re lying down or bending over, or pain in the chest or throat that usually comes after meals. Heartburn occurs when stomach acid backs up into your esophagus. Normally, when you swallow, a band of muscles around the bottom of your esophagus (your lower esophageal sphincter) relaxes to allow food and liquid to flow down into your stomach, and then tightens and contracts. If your lower esophageal sphincter relaxes or weakens, stomach acid can flow back up into your esophagus – causing heartburn. A number of things can cause heartburn, like stress, spicy foods, acidic foods and beverages, over eating and foods with a high fat content. Are Mylanta Liquid Antacids right for my symptoms? 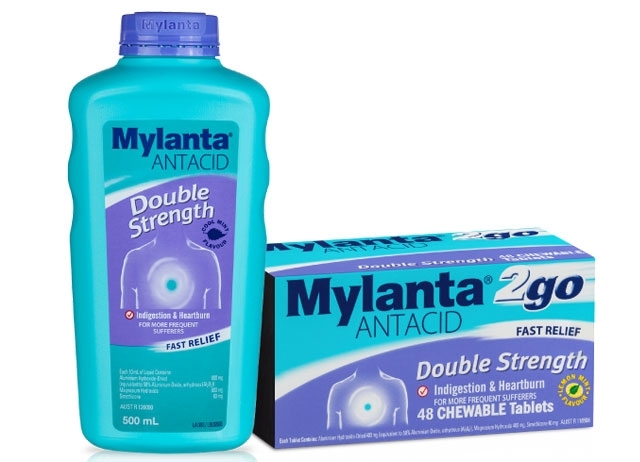 Mylanta Liquid Antacids help to relieve the discomfort associated with heartburn and excess gas by neutralizing the acidity of your stomach’s contents and by gently breaking down air bubbles trapped in the stomach. 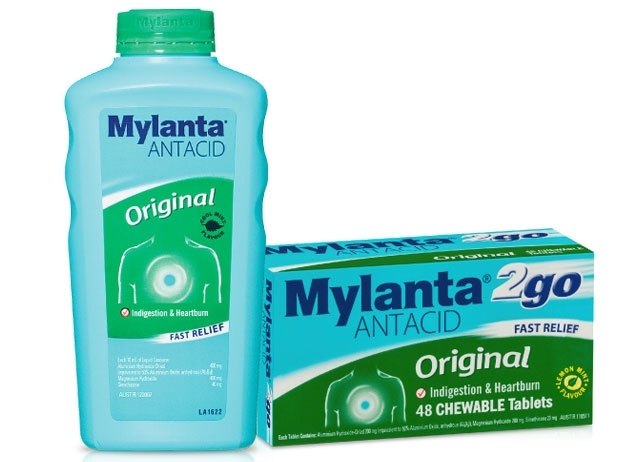 Mylanta Liquid Antacids start to work on contact to neutralize acid and to provide fast relief. If you’re unsure of whether or not Mylanta Liquid Antacids are right for you, seek advice from your healthcare professional. Can I give Mylanta Liquid Antacids to children with heartburn, acid indigestion or associated upset stomach? Can I use Mylanta Liquid Antacids if I have heartburn while pregnant or nursing? Talk to your doctor before taking Mylanta products while pregnant or breastfeeding. Read and follow all label directions. What will happen if I drink water when taking Mylanta? Drinking water with or after taking Mylanta will not affect how quickly or efficiently the product will work. Do Mylanta Liquid Antacids contain any nuts (including peanuts and tree nuts)? No, Mylanta Liquid Antacids do not contain any nuts. Do Mylanta Liquid Antacids contain lactose? No, Mylanta Liquid Antacids do not contain lactose. Do Mylanta Liquid Antacids contain sorbitol? Yes Mylanta Liquid Antacids contain sorbitol and xylitol. This may have a laxative effect or cause diarrhoea in some people. Do Mylanta Liquid Antacids contain preservatives? Yes, Mylanta Liquid Antacids contain preservatives that help stabilize the consistency of the product and prolong shelf life. Do Mylanta Liquid Antacids contain sugar or sugar substitutes? Mylanta Liquid Antacids contains small amounts of sugar subsitutes to improve the flavor of the product. Does Mylanta contain artificial flavors (e.g., additives or flavors)? Simethicone is an anti-gas (anti-flatulence) medication. It’s not absorbed by your body and acts directly in the stomach and intestines to gently break down gas bubbles. Aluminum hydroxide is an active ingredient which is indicated for treating heartburn, sour stomach and acid indigestion. It helps to neutralize stomach acid. Magnesium hydroxide is an active ingredient which is indicated for treating heartburn, sour stomach and acid indigestion. It helps to neutralize stomach acid. Are Mylanta Liquid Antacids gluten-free? Are Mylanta Liquid Antacids soy-free? Medicine is given an expiration date to ensure the quality and effectiveness of the product. It’s not recommended that you use medicine beyond its expiration date. What is the recommended temperature for storing Mylanta Liquid Antacids? Mylanta Liquid Antacids should be stored in the refrigerator after opening. After 6 months, they should be discarded. What are common signs of gas? Common signs of gas are voluntary or involuntary passing of gas, either as belches or flatulence, as well as abdominal bloating, pressure or discomfort. Gas is a by-product of the beneficial bacteria living in your intestinal tract that break down foods and create gases like nitrogen, methane and hydrogen sulfide. Foods high in indigestible fiber and complex carbohydrates – such as beans, bran, broccoli, cauliflower and cabbage – give that bacteria more raw material to work with, and hence, you get more gas after eating them. What are the hours during which I can call the Consumer Support Center? Our call center is open between the hours of 8.30am to 4.30pm (AEST/AEDT) on 1800 029 979, Monday through Friday. Are there other ways that I can reach the Mylanta Consumer Support Center? This site is published by Johnson & Johnson Pacific Pty Limited which is solely responsible for its contents.